Introducing: Aya Metwalli آية متولي: Music as a way of life? مش سعيد ليه؟- why are you not happy? Her music is difficult to explain, from folk, to electronic, trip-hop and everything in between seems to be a part of her style. Basically she uses her guitar and some other sounds to make her music unique. „what gives Metwalli’s songs an emotional resonance beyond the walls of her own sonic imagination is the way they emblemize something universal about present-day life in Cairo — a feeling of still motion that emerges in an anachronistic and lawless environment. It’s found in both her music and her city.“ writes Maha ElNabawi from Mada Masr. Some may compare her with the Beirut based musician Yasmine Hamdan although she sounds different than Hamda. Metwalli tries to experiment with a lot of various sounds and combine that with the guitar. Her lyrics are mostly her own and if she is not using her own writing, she uses the writings from blogs of her friends „and somehow turns the most non-rhythmic lyrics into melodies through classical intonations and a vibrato that later blend into more abstract and contemporary vocal chimes.“ writes Maha ElNabawi. Writing mostly in Egyptian she captures the lyrics and the context of the current issues which Egyptian society is facing during these turbulent years. Her Soundcloud page shows an amount of 22,8K followers and it is growing everyday and her facebook page shows more than 1,000 likes. She performs at local and alternative art spaces which emerged after 2011 in Cairo which deserves an own post though. As her followers are growing every day her experiences do as well as she says: “I grew as a person, I’m expanding emotionally and it’s showing up in my music.” She collaborates with other musicians as well such as the Cairo based Living too Late but goes beyond Egypt and she collaborated with Jordanian musicians as well. Songs like مش سعيد ليه؟ (Why are you not happy?) or صباحُ الخير (Good morning) are an example of combining the guitar with her own electronic personal sounds. She performs at locations such as the Cairo Jazz Club or at Room Art Space & Cafe. 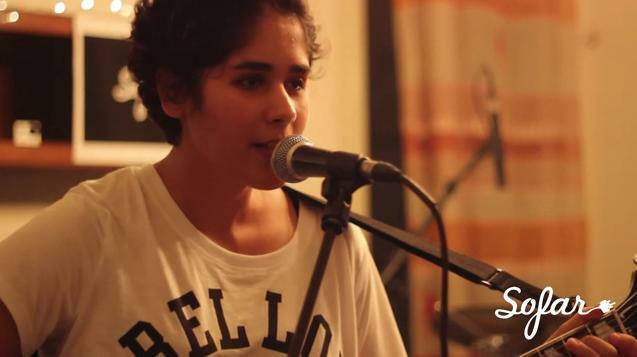 She becomes a part of the new emerging music scene in Cairo and an important addition. She has currently uploaded 32 songs on Soundcloud and is frequently performing on different locations in and outside of Cairo.